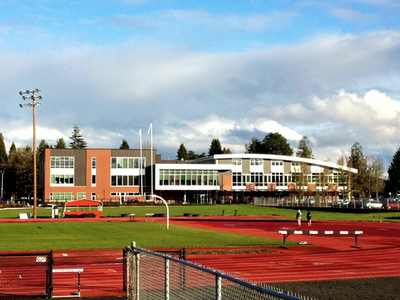 The Health and Wellness Center and track looking east. The contents of this image are for personal, educational, and non-commercial use only. This image may not be reproduced in any form without the express permission of Western Oregon University, Hamersly Library Exhibits Program. For questions or permissions, please contact the Exhibits Coordinator at (503) 838-8419 or libraryexhibits@wou.edu.